The compact archipelago of the Azores, specks of land in the middle of the Atlantic some 1,500km off the coast of Portugal, first appeared on my travelling radar a little over three years ago as I flipped through National Geographic’s ‘100 Journeys of a Lifetime’ coffee table book. There, whale-watching was highlighted, the author claiming the Azores to be a “marine paradise there the great mammals of the sea congregate all year round.” The Azores had got my attention, and as I researched more it held my attention….and became a niggling itch that needed to be scratched until finally, fate had me living in Porto, Portugal, and within a direct 2.5 hour flight with Ryanair to the dramatic landscapes of this alluring and mysterious group of islands. The sight of a big cruise ship parked in front of the main town of Ponta Delgada in Sao Miguel took away some of that undiscovered charm on arrival, but from our week there driving around and enjoying spectacular sea cliff views, natural pools, incredible crater lakes and endlessly rolling green hills, there was still charm in spades. We arrived to the airport in Ponta Delgada to a lovely and fresh late afternoon, and took a taxi to the pretentiously named VIP Executive hotel. There was nothing brisk or businesslike about check in, and, even though we were the only ones there, check-in took 20 minutes, but that’s because the Portuguese love to talk, and building a relationship by having a chat is far more important than clinical business efficiency. I felt sorry for the tour group of 15 Spanish who came in after us. They’d probably be waiting hours. We headed immediately out and started to walk down to the centre of town. It was all downhill, and took around 15 minutes, passing dreary apartment blocks that looked like rough council estates, people wearing tracksuits and trainers, clearly adidas is a popular brand here…we continued until we hit the small marina, which was pleasant enough….a real working marina rather than the bling-bling showroom style of Singapore’s that I was used to, and then we walked along the sea front,passing a nice looking area full of restaurants, and came to the 16th century Forte de Sao Bras de Ponta, now a military museum, which was closed. 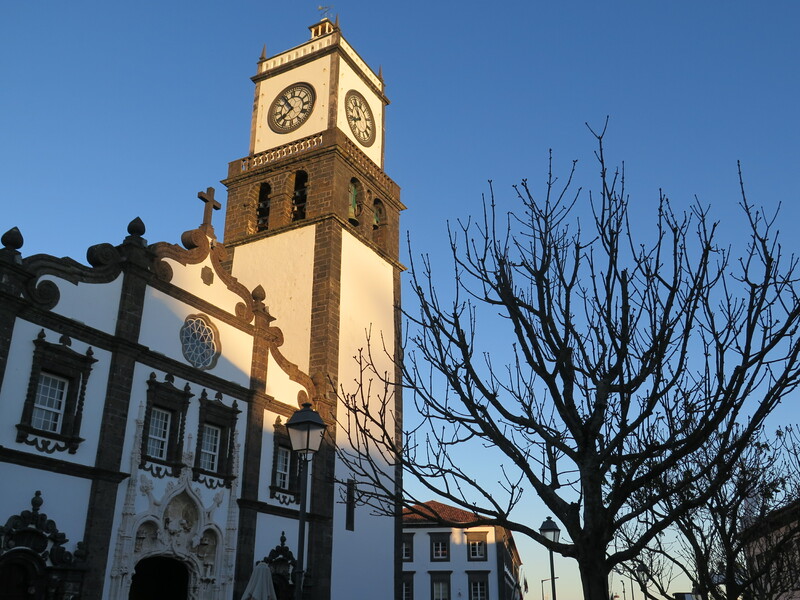 We walked up to a lovely church that was now softly bathed in the amber light of a surrendering sun: the gothicy Igreja Matriz de São Sebastião (Mother Church). Down from here you can see the impressive three arches of the Portas da Cidade (Town Doors), built in 1783, and the lovely square….and we strolled around the pleasant little town with it’s cobbled streets and little cafes, lovely mansions….for Ponta Delgada, the largest town in the Azores, enjoyed an economic boom in the 19th century, and the colonial and romantic architecture in the city is the evidence of this. It’s a small centre, and perfect for a stroll and a photoshoot. As we were strolling around we heard the sounds of a marching band, and came across the Ponta Delgada Easter Friday parade, which was happening in front of the Paços do Concelho de Ponta Delgada (Town hall), an elegant 17th century structure, and the place where now a priest was giving a reading from the Bible to a throng believers who had congregated around the fountain in front. The reading done, the procession continued up the narrow streets, people in groups carrying statues of the Virgin Mary, a near-lifesize crucifix with Jesus nailed to it, people with drums and trombones looking solemn as they filed past….a place where Easter still has religious meaning and isn’t all about chocolate eggs. 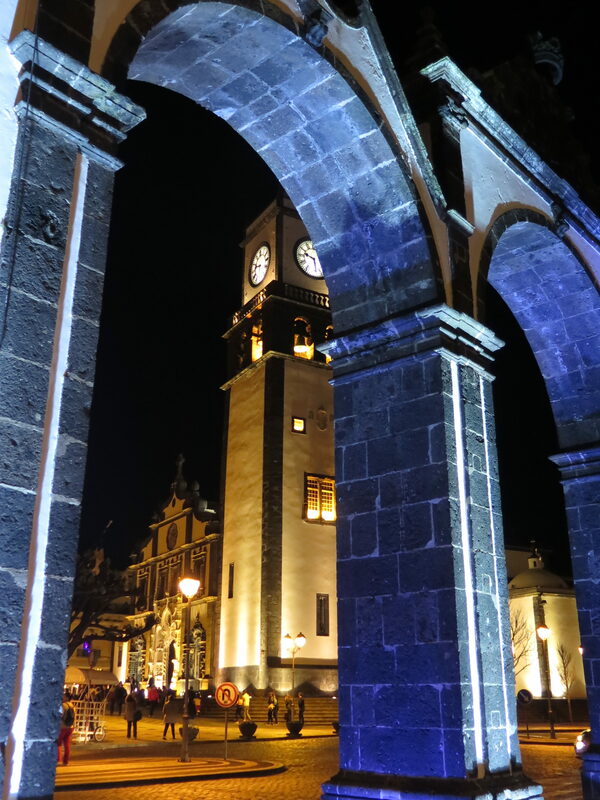 Ponta Delgada is pretty at night. The fountains glow, the Portas da Cidade are bathed in blues and greens….it’s romantic. We were hungry. Huddled in a corner on the chilly night we saw a couple devouring some pretty incredible looking hot dogs. Looking around, we saw several more people sat at the roadside, on steps, hanging out of car windows, all eating the same thing. We followed our noses and came to the hot dog vendor….and he was doing a roaring trade. 2 euros for a hotdog with trimmings that would even make a Venezuelan jealous. This guy puts olives in hi pero calientes. We got one each, and joined the other happy souls in an Easter Friday worship of a different kind. Thirsty, we headed up a street and came across the rustic Cantinha dos Anjos, a popular bar with visiting navy vessels, of the flags scrawled with messages draped around the place are anything to go by. Enjoyed an alcohol free lager and took in the ambience. 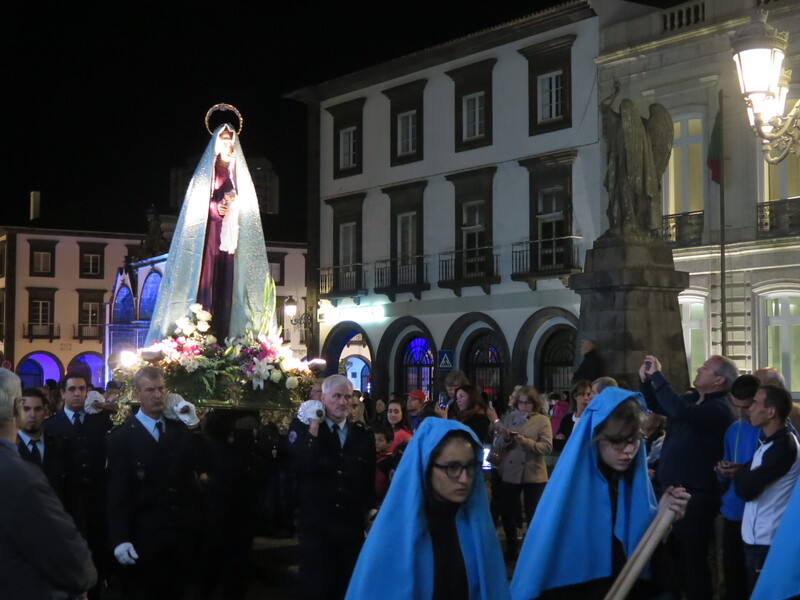 We walked back to the hotel to burn off the sin….a pleasant evening, and we were looking forward to exploring more of Ponta Delgada the next day.